I was not born when our country attained Independence. We salute the people, the leaders, the revolutionists and all of that period. 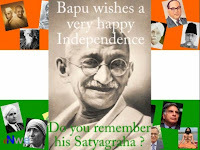 Our country witnessed so many mutinies, revolts, massacres, satyagrahas, besieges and sacrifices on the way to freedom. I studied our Indian history at school level only. That time itself I become a great fan of Mahatma Gandhi . I read his auto biography 'My Experiments with Truth' sometime ago. He was a normal person with all qualities of a Indian man. Honesty, truth, selfless service to nation, untiring nursing to leprosy patients, giving voice for untouchables, leadership, composed and confident in achieving his goals. He not only wanted freedom for ours, but also wanted unity among the people. Someone may argue about his opposing view about the partition and the partition was not done properly to our satisfaction. One must understand that his view about the unity of the people - whether they belong to different religions, they must unite as human beings. He saw the disunity among the people, disagreements among the then leaders during the freedom struggle. So he insisted on unity of people not of religions. He is the Father of our Nation. Non-Violence was his weapon. On the other side, he is not that good for a family man, his compulsory attitude towards his wife in carrying out the social works like cleaning the toilet, helping the ill and diseased, non-involvement in the brought up of his children. But he is the man who sacrifices his good, worthy and honorable family life for us , congregated all and raise our nation to a great democracy. Remembering his principles of non-violence, value and adopt them in our day-to-day life is the greatest tribute we pay him. Saluting politicians, Pinned flags on shirts, distributing sweets in schools, tri-colored logos, wallpapers on mobiles, different versions of Vande-Madarams - Good and Cool Celebrations. On the next day we all will have our daily dosage of poverty, price hikes, naxal violence, bomb culture, shoot outs, encounters, sabotages, border fights etc., etc., Our young guys must work to create some link between them and their country(not in the level of wallpapers and music). They can clean up our country from these evil packages that are supplied to us daily. At the stroke of the midnight hour, when the world sleeps, India will awake to life and freedom. A moment comes, which comes but rarely in history, when we step out from the old to the new, when an age ends, and when the soul of a nation, long suppressed, finds utterance. It is fitting that at this solemn moment we take the pledge of dedication to the service of India and her people and to the still larger cause of humanity.